In addition to their other duties, academic leaders are expected to network with potential donors and to be productive and enthusiastic fundraisers. More often than not, however, academic leaders are given little or no training on how to be savvy fundraisers for their institutions. 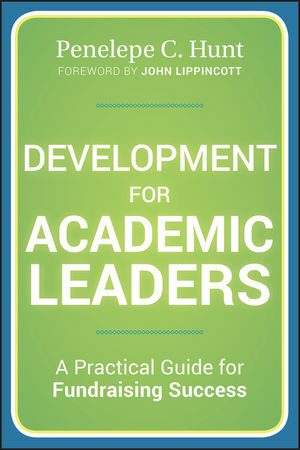 Development for Academic Leaders is a much-needed resource that offers a concise yet comprehensive guide to fundraising for those who are new to the process. The book clarifies roles, responsibilities, programs, activities, politics, and funding sources as well as offering a review of the overall process. Written by Penelepe C. Hunt, a successful practitioner of and noted expert in academic fundraising, the book includes information on attracting and retaining effective development officers and contains suggestions for deans (and other campus leaders) for working effectively with these valued members of their institutions. Hunt introduces novice fundraisers to the cycle of giving (identification, qualification, cultivation, solicitation, and stewardship) and provides information on how and when to take part in the fundraising process. She defines the various types of funding including annual gifts, major gifts, planned gifts, and principal gifts and reveals why ascertaining which type of gift will be most appealing to a donor is an important part of planning for a successful solicitation. Development for Academic Leaders also contains suggestions for overcoming reluctance on the part of leaders to ask potential donors for a gift. Hunt explains that donors do not give merely because our programs need and deserve support. They give because of their own desires, passions,and aspirations. Development for Academic Leaders also reveals the importance of participating in your institution's overall development communications efforts and offers a general overview of campaign and event principles and how you can use these funding strategies to the advantage of your college. For any academic leader who participates in their program's fundraising efforts, this important resource offers a wealth of information for becoming a creative, skilled, and successful part of the fundraising team. Penelepe C. Hunt is a professional fund-raiser, teacher, management consultant, and executive coach with more than twenty-five years of experience in the development field. She led Northwestern University's $1.5 billion campaign and has served as vice chancellor for development at the University of Illinois at Chicago. Hunt has trained more than 2,000 academics and development officers to increase their success in fundraising.